Hi! I'm Kristina, mom of three crazy kiddos, and I'm starting a new series on parenting. I'm not a parenting expert, but I'm trying really hard to be a better mom every day. I'd love you to join my challenges, share your tips and advice, and work together with me on a quest to be a better parent. I share tips I find in our newsletter too as well as on my Becoming a Better Parent pinterest board. Come learn with me! A few weeks ago we were playing at a park surrounded by beautiful houses. My kids were happy and playing nicely, so I just stood admiring the intricate detail on each house while I watched them play. Suddenly I heard the meanest voice coming from one of the houses. The mom or grandma or babysitter (or??) was clearly yelling at a child to do something or STOP doing something and she went on and on and on. I was shocked and a little embarrassed that I was hearing this exchange. The person clearly probably had no idea that she was yelling that loudly or that her mean words were echoing so far. I couldn't tell what the yelling was about and I have no idea what was going on, so my point in writing this post isn't to judge, but it made me stop and think. If someone were a fly on the wall in my house (or outside my house listening in), what would their opinion be of me? What would they hear? Or for that matter... what do the people inside my house already think of me? If moments of my day were recorded and played back at me, would I be proud that I had handled the situations well, or would I be hanging my head in shame... mortified by what I said? If I am being honest, I definitely have many "hang my head in shame" moments. Just this week my 5-year-old hit my toddler with a plastic baseball bat and I came unglued. I think we were all a little traumatized after I flipped out and I definitely didn't help calm anyone down... especially my hurting daughter. I definitely have moments when I get inappropriately angry as a parent, but they are happening less and less as I use the strategies I've shared with you before. As Mother's Day approaches and I think about what it means to be a mom and what I love about being a mom, I have also reflected on ways that I wish I were a better mom. The words that I say and tone that I use are definitely some of the things I think about daily. My challenge to us all this next week is to be a fly on the wall in our own homes. Listen to the words you say and the way that you say them. Also listen to how your kids talk to each other and their friends. They are often a reflection of you. I find that when my kids are being bossy, snippy, judgmental, critical, or unkind it usually ties to my behavior over the previous week and how I've been treating them. After this little weeklong challenge, let's check back in and chat. I guarantee we'll all have some thoughts about ways to be kinder, more thoughtful, and more in control of ourselves as parents. I'd love for us to learn together and share our ideas. 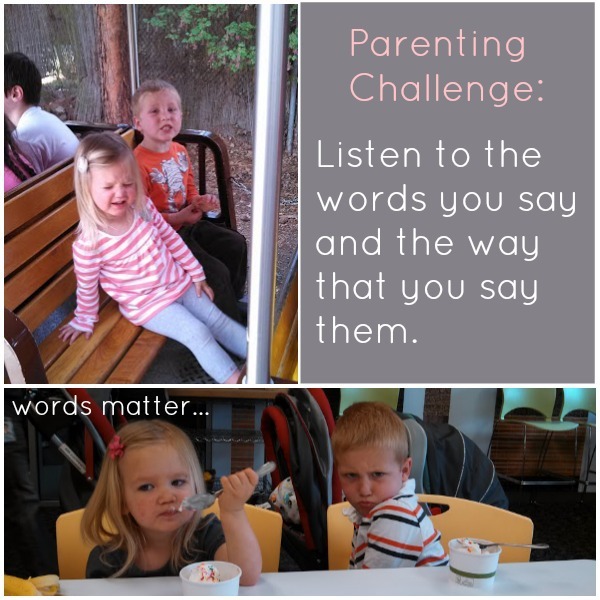 I'm not a parenting expert, but I do know that words matter. 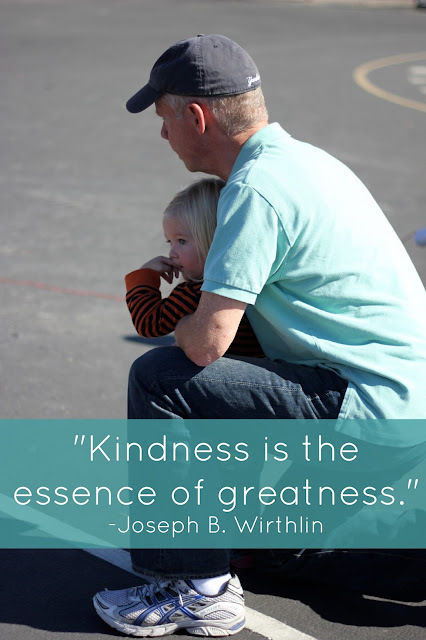 I also know that "kindness is the essence of greatness" and I don't just want to be a semi-good parent... I want to be a great one. I want to be a parent that my kids want to spend time with, confide in, and feel comfortable around. The words that I say and how I say them will make a big difference in helping me to become the person I want to be. Do you ever regret things that you say to your kids (or spouse)? Have you had any "hang your head in shame" moments recently like me? I'd love to hear your parenting goals and struggles too. Please share any thoughts in the comments and let's work together to be better parents this year. You can find our favorite parenting resources under our Best of Parenting tab. I'll be screen free tomorrow enjoying my family, so have a fabulous Mother's Day weekend! i love this... we've heard the same from our neighbor's behind us. i will admit, too, that there are times when i've responded to my son, then heard what and how i said it a second later.... good thoughts for us all. pinned and shared. What a great challenge - I'm In! Excited about this challenge! I'm always looking for new techniques that I can use to 'keep it together'! !